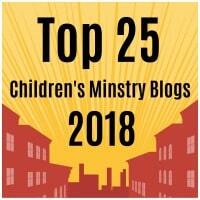 This entry was posted in Activity Sheet, Bible Crafts, Moses, OT Crafts, Printables and tagged Aaron, activity sheet, chariot, crossing the Red Sea, Moses, Pharaoh, puzzle, Red Sea, staff. Use this wheel to help your kids learn the 10 plagues of Egypt. Color and cut out both circles. Make a small hole into the middle of the circles and stick a metal brad through it. Open and bend the legs. This entry was posted in Moses, OT Crafts and tagged 10 plagues, 10 plagues of Egypt wheel, Egypt, God, Moses, Pharaoh, plagues of Egypt, power, ten, ten plagues. Abraham’s move to Egypt and his deception towards the pharaoh. Joseph becomes second in command over Egypt. God freeing His people through Moses. Cut out all of the pieces. Glue the yellow pieces onto the two large pieces. Attach both blue pieces with the small white rectangular piece. 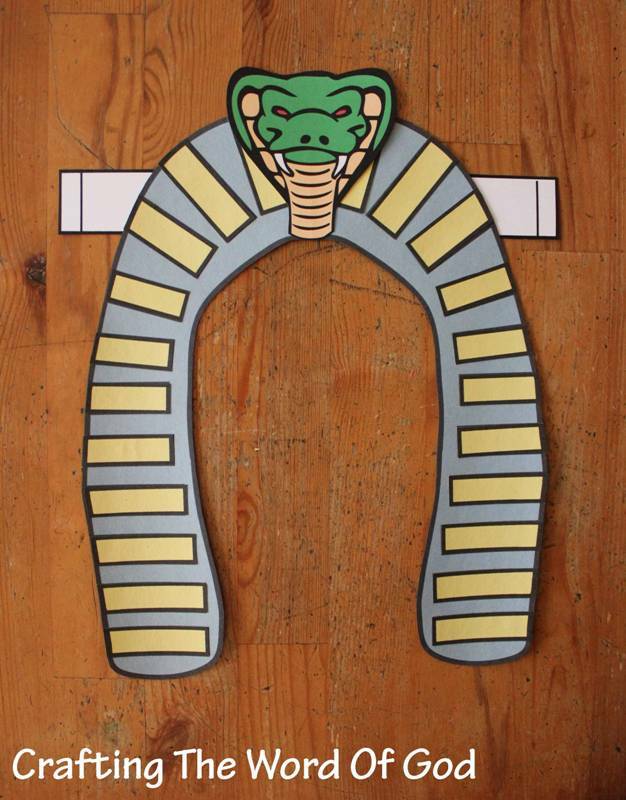 Next glue on the snake head to the head dress. Finally attach the head dress to the child’s head using the white stripes. This entry was posted in Abraham, Bible Crafts, Joseph, Moses, OT Crafts and tagged Abraham, bible crafts, children, craft, crafts, Egypt, Exodus, famine, God, governor, Israel, Israelites, Joseph, king of Egypt, leave Egypt, Moses, Pharaoh, Pharaohs crown, Pharaohs Head Dress, plague, plagues, Sarah, sister, slave, sold, true God, wife. 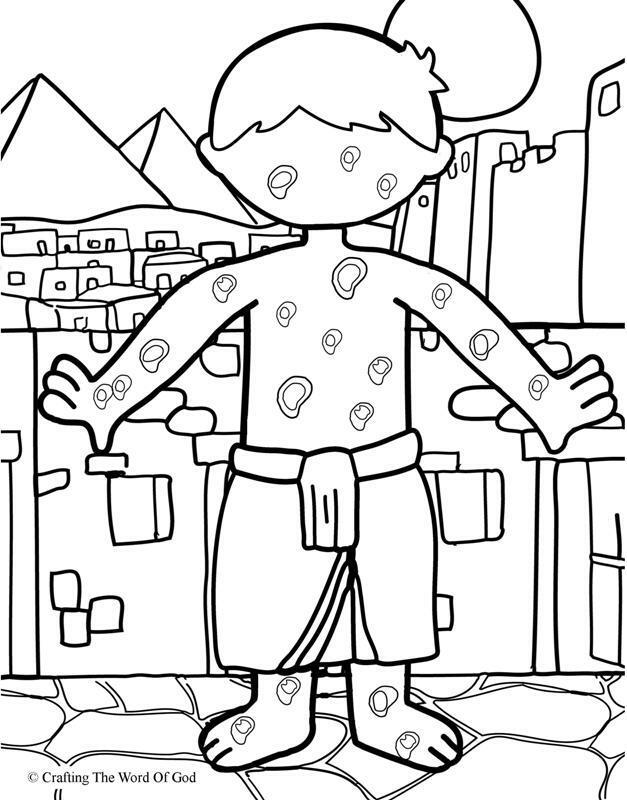 This entry was posted in Bible Crafts, Coloring Page, Moses, OT Crafts, Printables and tagged 10 plagues, bible crafts, boils, color, coloring page, craft, crafts, Egypt, God, Moses, Pharaoh, plague, plague of boils, print out, printable, ten plagues. 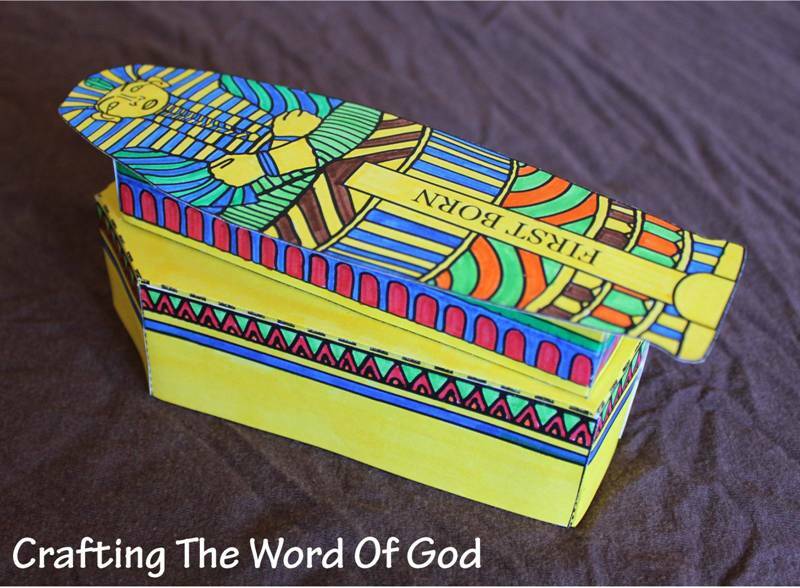 This entry was posted in Coloring Page, Moses, OT Crafts, Printables and tagged basket, bible crafts, birth, color, coloring page, craft, crafts, God, Moses, Pharaoh, Pharaohs daughter, print out, printable, protection, river. 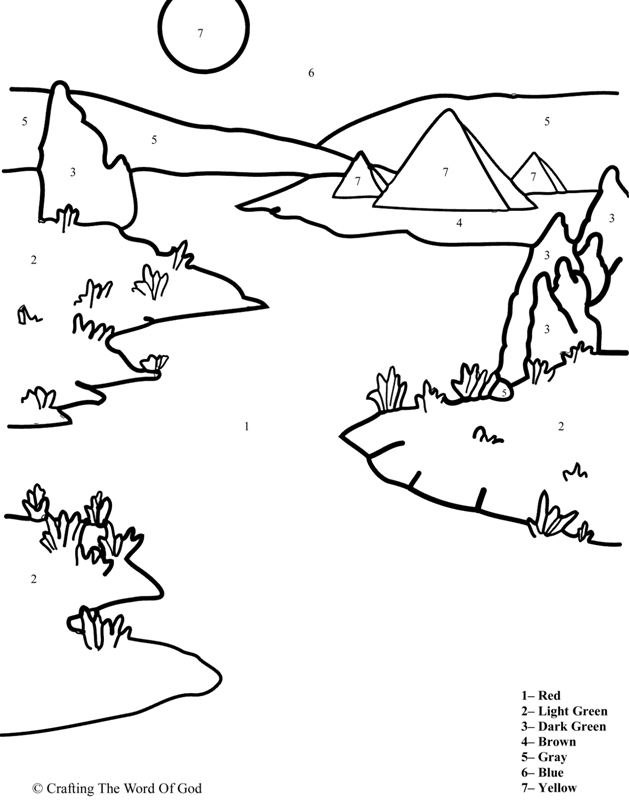 This entry was posted in Color By Number, Moses, Printables and tagged bible crafts, blood, color by number, coloring page, craft, crafts, Moses, Nile river, Pharaoh, plague, plague of blood, printables. Today’s crafts are based on the tenth and last plague on Egypt, the plague on the firstborn. Cut out all three pieces. Fold both of the larger pieces on the dashed lines creating creases. Assemble both of the large pieces. Finally glue the piece with the face to the rectangular piece. Glue strips/ pieces of red tissue or construction papper to the image. You can also use paint or glitter instead of tissue/ construction paper. For a variation of this craft you can tape crumpled large sheets of red tissue or construction paper to an actual door post. This way when your kids see it it will remind them of the Bible story. 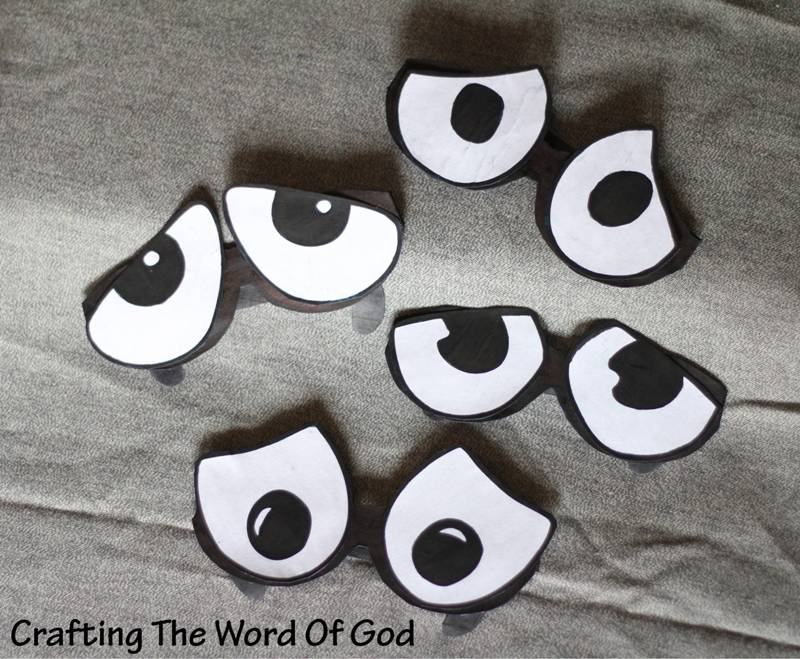 This entry was posted in Bible Crafts, Moses, OT Crafts and tagged bible crafts, craft, crafts, death, firstborn, God, Moses, Pharaoh, plague, plague on the firstborn, punishment, ten plagues. Today’s craft is based on the ninth plague on Egypt, the plague of darkness. Glue all the pieces onto black construction paper. Cut out the templates from the construction paper. Glue a pair of eyes onto one of the frames. Finally glue on the side pieces. 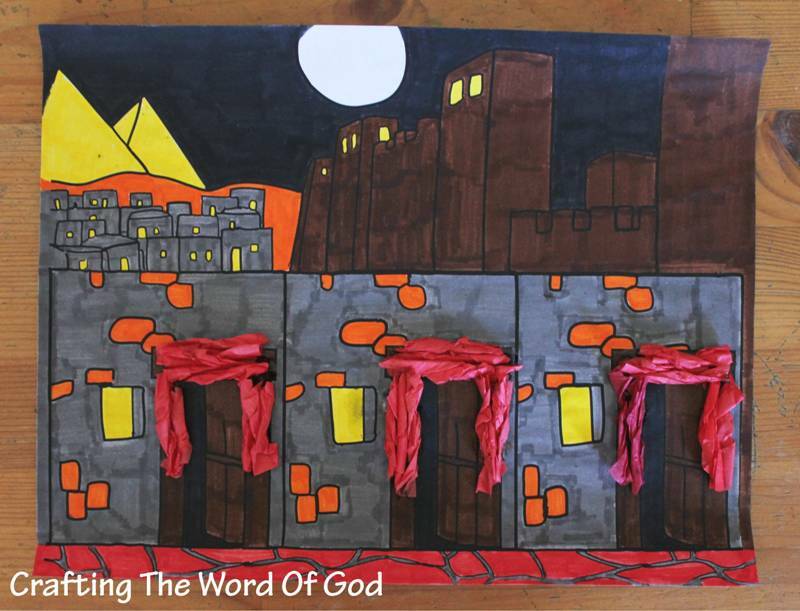 This entry was posted in Bible Crafts, Moses, OT Crafts and tagged bible crafts, craft, crafts, darkness, Egypt, Moses, Pharaoh, plague, plague of darkness, sunglasses. 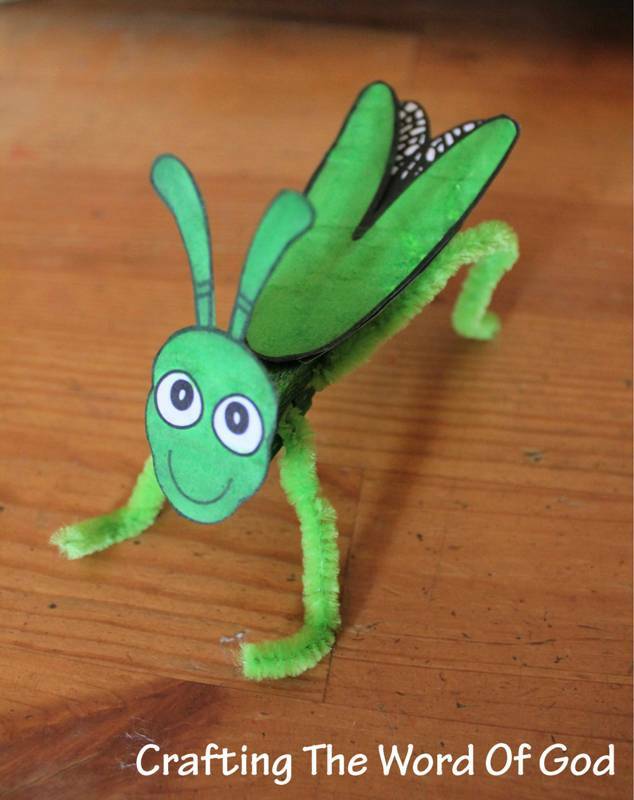 Today’s crafts are based on the eighth plague on Egypt, the plague of locusts. Color a wooden clothespin green using a permanent marker. Color and cut out every piece. Glue each piece to s piece of green construction paper. Cut out each piece from the construction paper. Glue the wings to the the clothespin, then the covering over the wings. Take the bracket piece and fold it on the solid line making a crease. Glue the smaller square to the back of the grasshoppers face and the other end to the clothespin. Grab two green chenille stems/ pipe cleaners. One should be 5″ (the front legs) and the other should be 7″ (the back legs). With a hot glue gun, glue both pieces in place. (The shorter piece will go into the larger hole of the clothespin and the longer piece will go into the small hole of the clothespin). This craft is a repeat, but I wanted to include it. Cut out all of the pieces leaving a border of cardstock around each piece. Glue the pieces onto a sheet of black construction paper. Glue each wing to the back of the grasshopper pieces. Take the rectangle piece and fold along both solid lines, making two creases. Add glue to one side of the rectangle piece and stick it on one of the grasshopper pieces, right between the thorax and the abdomen. Do the same thing with the other piece of grasshopper, making sure to line up both grasshopper pieces. The legs will now be able to hold up the entire grasshopper. 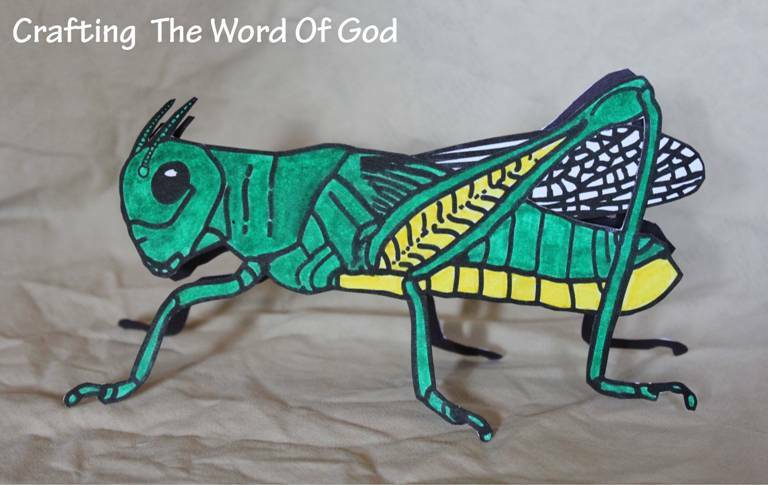 This entry was posted in Bible Crafts, John The Baptist, Moses, OT Crafts and tagged bible crafts, craft, crafts, Egypt, grasshopper, locusts, Moses, Pharaoh, plague, plague of locusts. Today’s craft is based on the seventh plague on Egypt, the plague of hail. Cut three pieces of yarn/string. (2- 10″ pieces and 1- 12″ piece.) White, tan or blue sting works best. With a one hole punch, punch three holes, even spacing, on the bottom of the cloud. Place one of the shorter strings through one of the side holes and tie the string end on itself. The bulge from the knot will keep the string from falling completely out of the hole. Do the same thing with the longest piece and then with the final short piece. Glue the hail onto the string; three on each side of a string; six total for each string. This way when the mobile is hanging on a wall, if the strings twist you can still see the hail. 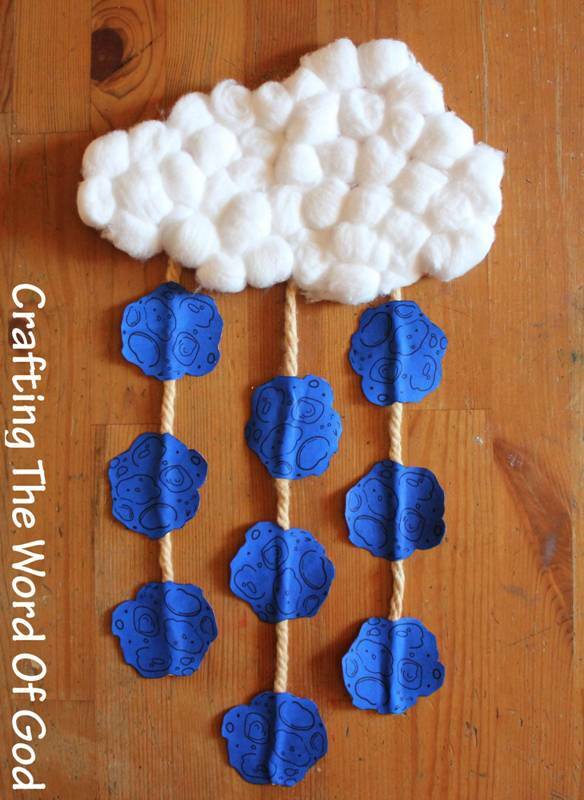 Add glue to the cloud and then add on cotton balls until the whole cloud is completely covered. You can cover both sides of the cloud with cotton balls if you will be hanging it from the ceiling or a doorway. Add a loop to the back of the cloud using yarn and your kids can now hang it on the wall. This entry was posted in Bible Crafts, Moses, OT Crafts and tagged bible crafts, craft, crafts, Egypt, hail, Moses, Pharaoh, plague of hail, ten plagues.